3. 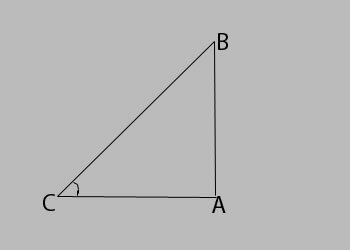 From a point C on a level ground, the angle of elevation of the top of a tower is 30 degree. 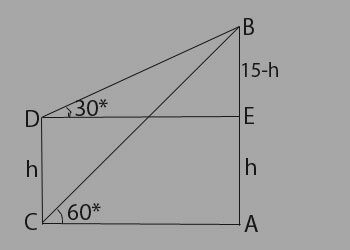 If the tower is 100 meter high, find the distance from point C to the foot of the tower. Please always remember the value of square root 3 is 1.73, and value of square root 2 is 1.41. 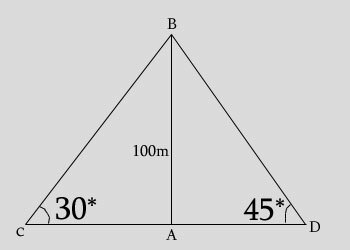 This will be very helpful while solving height and distance questions and saving your time. 4. A man standing at a point C is watching the top of a tower, which makes an angle of elevation of 30 degree. The man walks some distance towards the tower to watch its top and the angle of elevation become 60 degree. 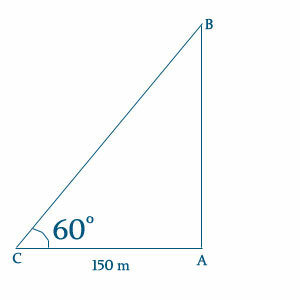 What is the distance between the base of the tower and point C.
Please refer to the image. One of the AB, AD and CD must be given. So data is inadequate. 5. A man is watching form the top of the tower a boat speeding away from the tower. The boat makes the angle of depression of 45 degree with the man's eye when at a distance of 60 metres from the tower. 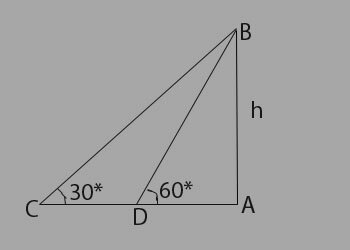 After 5 seconds the angle of depression becomes 30 degree. What is the approximate speed of the boat, assuming that it is running in still water ? Let AB be the tower and C and D be the positions of the boat. 6. 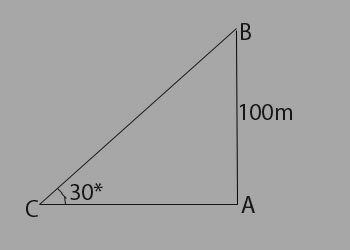 The Top of a 15 metre high tower makes an angle of elevation of 60 degree with the bottom of an electric pole and angle of elevation of 30 degree with the top of pole. Find the height of the electric pole. Let AB be the tower and CD be the electric pole. 7. A toy leaves the earth at a point A and rises vertically at uniform speed. After two minutes of vertical rise boy finds the angular elevation of the balloon as 60°. If the point at which boy is standing is 150 m away from point A, what is the speed of the toy ? Let boy is standing at C position and A is that position from where toy left eartg and B is the position of the toy after 2 minutes. Thanks very helpful. I thought prepared aptitude for exam properly but now only found I just answered only 3. Thank you. Very useful explanations.